Feeling particularly stressed one Saturday morning after a long workweek, my wife suggested that I should go and get my LEGO bricks out of the attic and build something. I immediately came upon my disused LEGO Dacta 9701 Control Lab Building Set, bought after saving many years of birthday money. 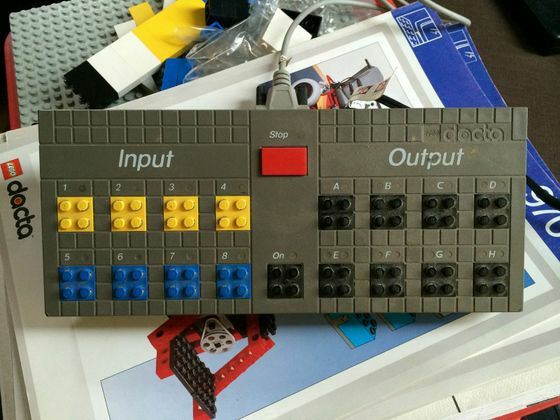 This kit was the precursor to LEGO Mindstorms. Unfortunately, the software in the kit was on floppy, and a cursory search showed that it was not even close to supported in Windows 7. More searching found that the protocol for the 9751 device (also labeled 70909) had been reverse engineered, so I decided to write a python object to control the interface. You'll find it below.